If you want to get fit then a visit to the gym is one of the best things that you can do. However, if you are not careful, then it is very easy to get injured in the gym.As you know, there is a lot of equipment at the gym. All of this equipment needs to be used in a certain way otherwise you can risk serious injury. Perhaps the worst culprits are the machines which involve lifting weight. If the proper technique is not followed there are a number of injuries that can occur, including muscle tears or joint strains. However, it is not just this equipment which can cause problems. You may also be at risk using something as simple as a spinning cycle or even a treadmill if they are not used correctly. 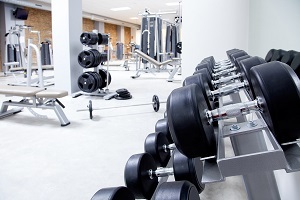 In fact, anything in the gym can cause serious problems if you do not know what you are doing. Before you head to the gym I suggest that you carry out a bit of research with regards to the correct techniques to use for each piece of machinery. This is the only way that you are going to be sure that you will be using them correctly. If you are at the gym then you may want to book an orientation or initial consultation with a fitness trainer. The staff at the gym are there to help so don’t be afraid to ask. In addition to using the equipment properly (i.e. by following proper technique)it is important that you do not push yourself too hard, and carry out a warm-up beforehand. If you do not do either of these things then the chances of injuring yourself using the equipment are very high. Therefore you want to ensure that you take every possible precaution. This is the only way that you will be able to guarantee your safety. As you can see, when it comes to safety in the gym it is absolutely vital that you stay on top of things. Don’t worry as the machines are not difficult to learn how to use and if you use them properly then you will cut your risk of injury considerably.